The Maroon and Gold—who were seeded fourth in the tournament—shocked the first seeded Rouge et Or, by leading the score until the very end. The Stingers’ biggest fear was Laval’s ability to shoot from the three-point line, but according to Laval Head Coach Guillaume Giroux, they played in a large range preventing Laval from shooting too much. “We kept our composure, we kept our focus and it was really important for us to run them off the three points line,” said Gittens. 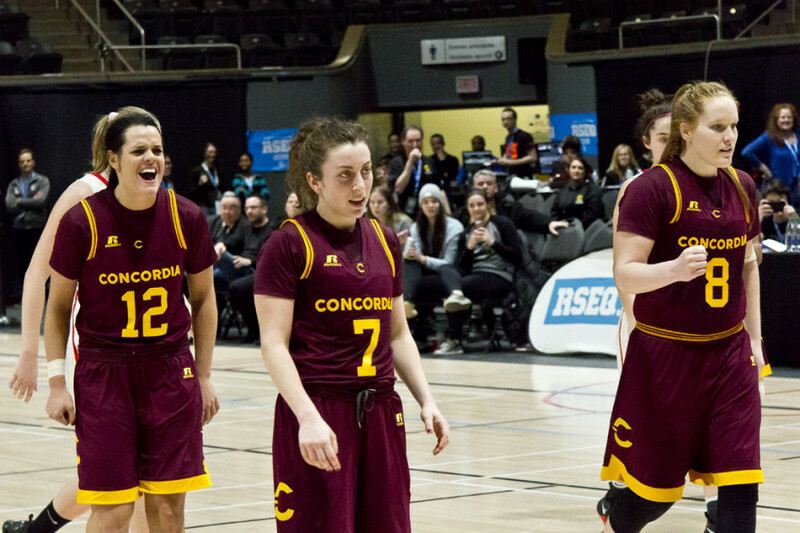 Laval was able to keep the game close—even cutting a five point deficit down to a single point—but Concordia was able to keep their heads above the water and stay in the lead. “In the fourth quarter the energy just lifted, we all looked at each other like ‘girls, we have five minutes, this is our five minutes,’” Richelle Gregoire said. With 11 seconds left in the game, Stinger guard Aurelie D’Anjou Drouin sunk a pair of key free throws to give Concordia a four point lead. Laval would never have been able to get two possessions with so little time remaining. At that point, the Stingers knew they had pulled off the improbable upset. Marilyse Roy-Viau was named player of the game for the Stingers. Even if she made four faults in a row at some point, she stayed on the court, knowing her importance there. Roy-Viau scored 18 points in total and was only out for 2 minutes. “My coach did a good job sending me off and put me when it was the right time,” Roy-Viau said. Jazlin Barker was also a key player in the game, scoring 18 points, including three from the three-point line. “Some of the girls came out the bench and produced and I am really proud of that, we could build on that so on Saturday, I’m ready,” said Roy-Viau. Roy-Viau, Gregoire and Tamara Pinard-Devos are the three players who will leave the team after this season and who will now have the chance to participate to the finals, and potentially going to the National competition before leaving. 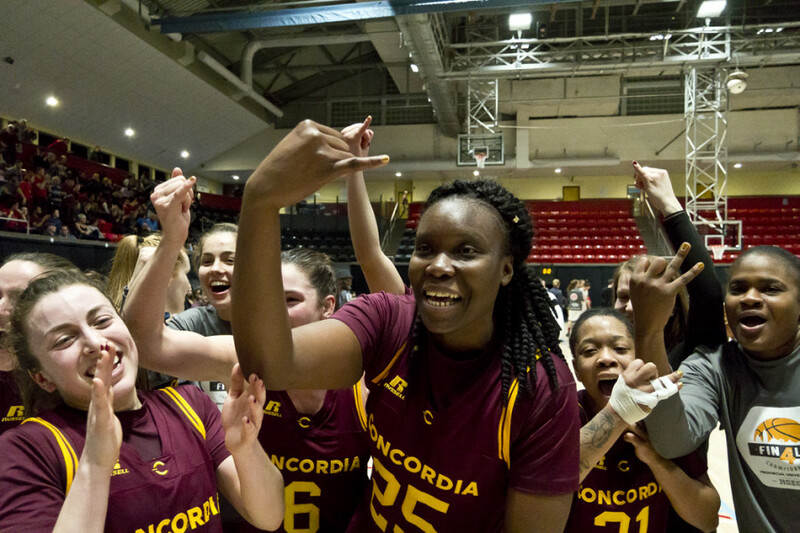 Once Concordia clinched their upset win over Laval, the team stuck around to watch the game that would decide who they’d be going up against in the finals on Saturday. They got to witness the second seeded McGill Martlets win 51-48 against the third seeded UQAM Citadins. UQAM held early leads as large as nine points and were completely limiting the effectiveness of McGill’s talented center Alex Kiss-Rusk. She scored just eight points in the game, and that helped UQAM get out to those early advantages. The offensive catalyst for the Citadins was their center, Jessica Lubin, who scored a game-high 12 points in the first half. “When Lubin got going, we had a hard time defending her,” said Thorne. McGill outscored the Citadins 15 to six in the third quarter, and entered the third quarter up 37-31. From that point on, the Martlets controlled the game and clinched a berth in the final. Despite the win, McGill guard Gladys Hakizimana–who was named the game’s MVP–didn’t think they played as well as they could have. Saturday’s meeting will be the fifth of the season for the Martlets and Stingers. They split the regular season at two wins apiece. 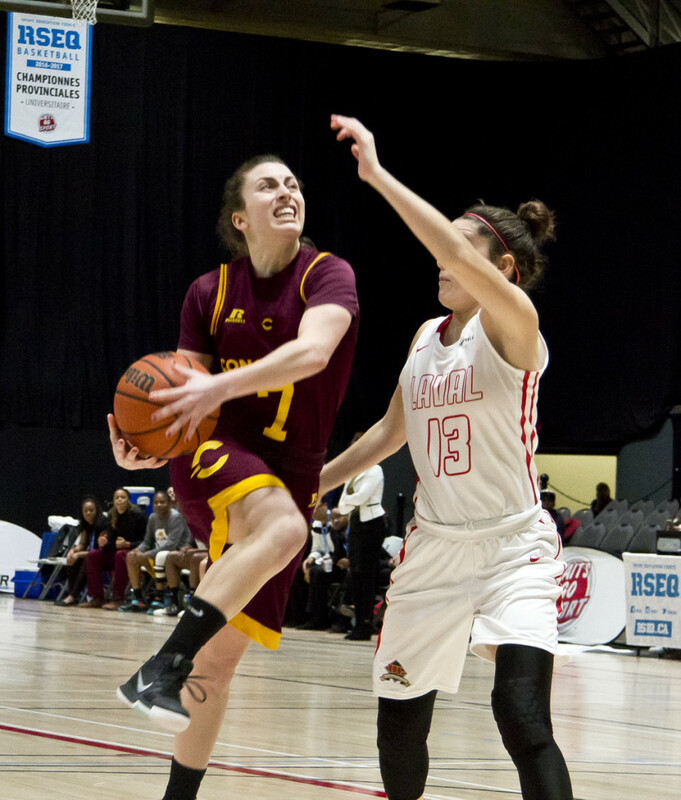 The RSEQ Final Four women’s basketball will tip off at 3 p.m. at Centre Pierre Charbonneau.